A lot of memories of growing up seem to have food in them. I guess because most of our socializing was done over a cup of tea, or a meal, or even a community supper. We used to say that we had to eat in shifts because the table wasn’t big enough for everyone to gather round at once, was nothing at my place to have 8 or 10 around at meal time. Nowadays when anyone says stew, you usually think of beef in the slow cooker with a thick broth and big chunks of vegetables. But growing up, when we had stew, it was usually stewed fish, or stewed salmon or stewed beans. Here in Nova Scotia if I mention stewed beans to people they have no clue what I am talking about, all they know are baked beans. I never cared for baked beans, but stewed beans, YUM! The picture on the left comes from a Newfoundland Recipes site (click it to go there), but isnt quite like what I was used to. 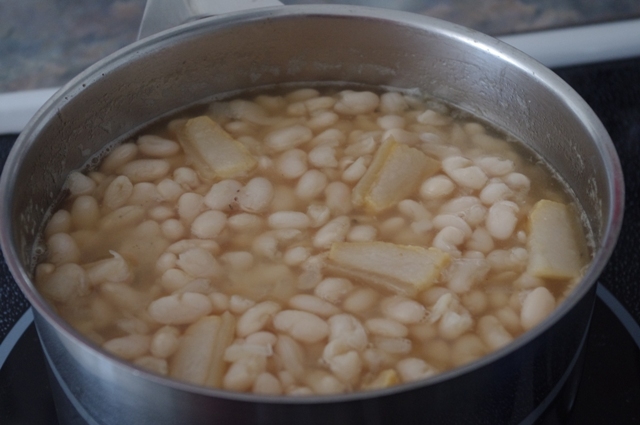 Similarly it was white naval beans, soaked for a while, and also an onion, but we’d use salt beef instead of salt pork. When cooked up so the beans were soft yet firm and holding their shape it was delicious, even more so with a bit of ketchup. Then there is stewed cod and stewed salmon, both are the same recipe, just replace the fish. The recipe I linked to here has carrot and uses broth, but what I had growing up just had potato, water, fish and onion. And of course substituting salt beef for salt pork. I don’t think we precooked the cod or onions either like the recipe says, but I’m sure either way is delicious. Simple meals, but a taste of home and of growing up, and something I still like to have today.